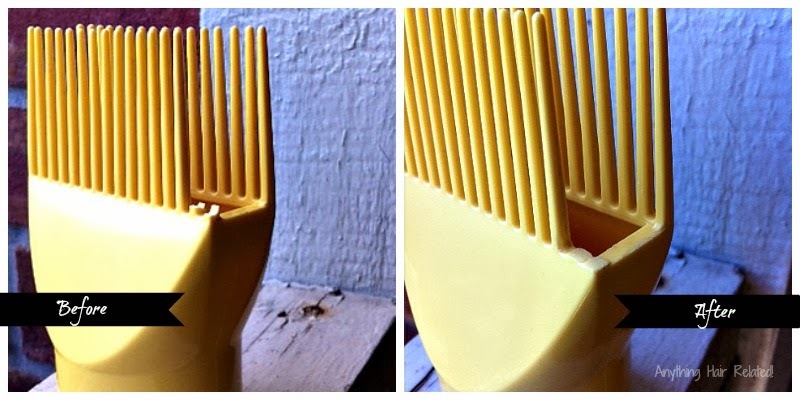 I stepped on the comb attachment that came with my Conair Pro Yellow Bird Blow Dryer and snapped a few teeth. This blow dryer is my one true love as far as hair appliances and was worth every penny. We have been together for about 2 years and it has worked like a perfect dream until stepping on the comb attachment caused this nightmare. My first thought was to continue using it as is because most of the teeth were still in tact. But considering how the sharp edges of the shattered teeth could break my hair, I decided against it. I decided to repair the damage on my own and it was an easy do it yourself project. 2 comments on "DIY: Snag-Free Comb Attachment"